Selected by New England Monthly as one of 6 architects to design a "Fantasy House"
Selected to be a member of the "Practical Homeowner Institute"
Selected by "Family Fun Magazine" to be one of 8 architects nationally to design a "play structure"
Winner of Habitat for Humanity, New Haven’s 2003 Master Builder Award. Home Builders Association of Connecticut's 2005 HOBI Award for Best Custom Home 3500 - 4500 sq. ft.
House Beautiful's "Home Remodeling and Decorating"
2002 The Architects League of Northern New Jersey 1st Annual Davis Fund Speaker. Producer, critic for Building Beauty, "HOME A unique digital conversation using design, critique and discussion the the home". Co-host of 14-part CNN/Money website series “Home Work” 2010. Financial News Network "Real Estate Magazine" featured architectural commentator. Participant, 6th, 7th, 8th and 9th Annual Habitat For Humanity Men’s Auxiliary Bake Sale. “Most Creative” at 2002 Sale. Exhibitor “Where Earth Meets Sky” exhibition at the Creative Arts Workshop, New Haven. Invited artist”Bitsie’s Bash” centerpiece for the Alliance for Architecture/Arts Council for Greater New Haven. Guest on CNN "Open House" television show. Guest on "On The House" radio show. Guest on "The Money Pit" radio show. Guest on "Ask Andrea" radio show. Guest on “Business Week Weekend” television show. 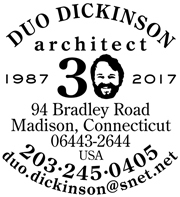 Custom Home Designs in Connecticut, New York, Rhode Island, Minnesota, Michigan, North Carolina, New Jersey, California, Nebraska, Indiana, Louisiana, Colorado, and Massachusetts. Design architect for three homes for suburban Tokyo, Japan. Residential Additions and Renovations in Connecticut, Massachusetts, Vermont, Ohio, Washington, D.C., Illinois, Colorado, New York (Westchester County, Duchess County, the Adirondacks, Long Island and New York City). Town of Guilford Design for Lake Quonnipaug Bath House, Guilford, CT.
St.James Episcopal Church, Woodstock, Vt.
Southern Connecticut Hebrew Academy, Woodbridge, Ct.
Board Member, Properties Committee, Mercy Center, Madison, CT (1998-2001). Organizer of successful “Save the Madison Theater” campaign for Madison Cultural Arts. Cofounder (w/ Jeremiah Eck and Dennis Wedlick) of the Congress of Residential Architecture. Advisory Council, Reinvention 2004 Conference.